Oyster habitat in North Carolina is unique. 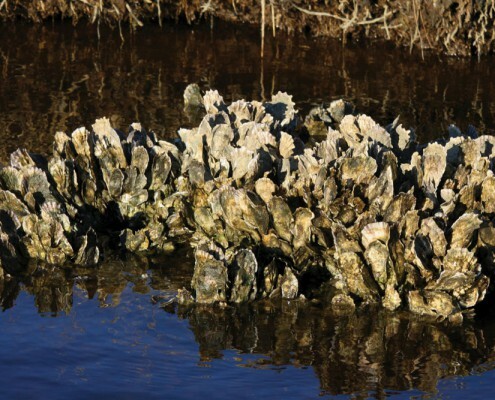 Oyster habitat in North Carolina ranges from deep water reefs in the Pamlico Sound (sub-tidal) to low relief patch reefs in intertidal waters and reefs fringing salt marshes along our estuarine shorelines. We are the only state that has both types of reefs on our coast. Oysters and the reefs that they form provide several ecological, economic and social benefits. 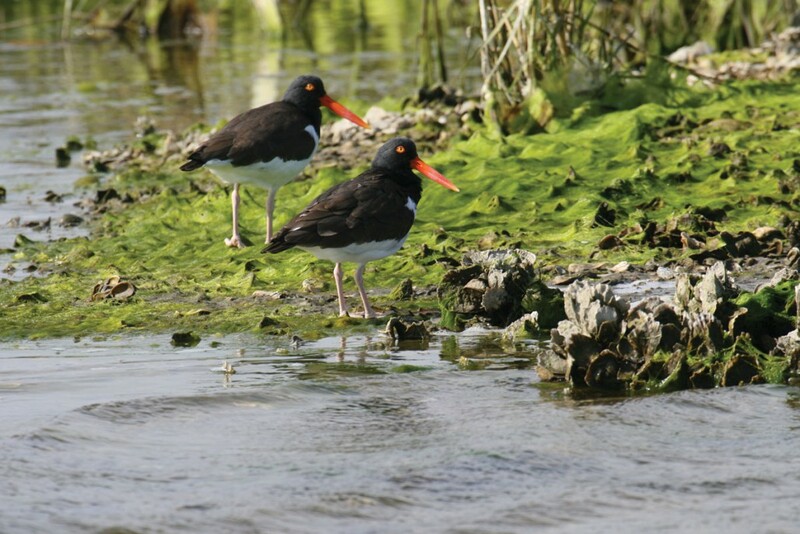 Known as a keystone species in the estuary, their health reflects that of the overall coastal ecosystem. Oysters support a viable commercial and recreational fishery that is an important part of North Carolina’s cultural heritage and economy. Oyster reefs also support the production of crabs and finfish valued at over $62 million annually. Two tanks of water from the sound, one with oysters, one without. Photo courtesy David Cerino. 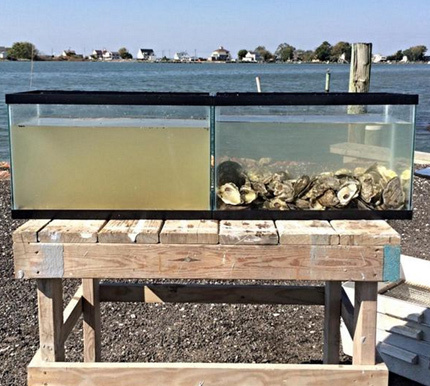 As filter feeders, oysters remove harmful pollutants, sediment and excess algae from the water. An adult is capable of filtering between 15-35 gallons of water a day. As oysters filter, they also provide an important link in the estuarine food web by transferring nutrients from the surface (plankton) to the bottom. 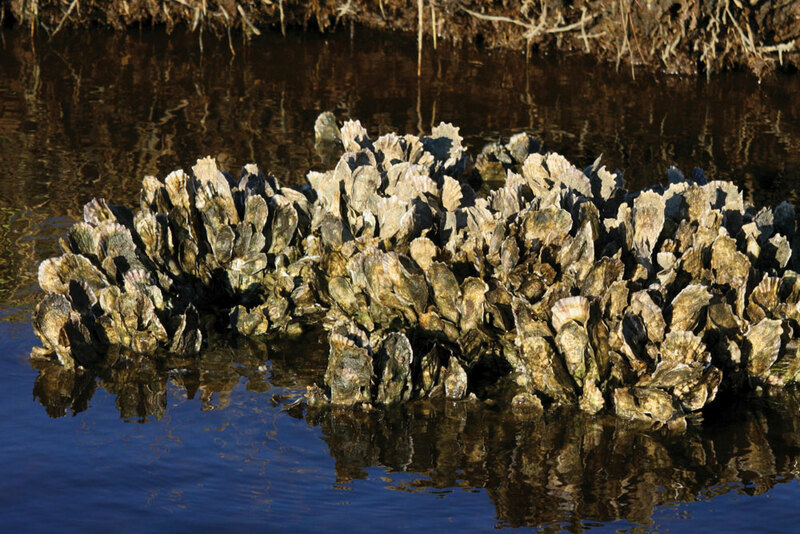 Oyster reefs provide essential habitat for a diverse collection of aquatic animals, including many important commercial and recreational fish species. One healthy oyster reef can be home to an estimated 300 different adult and juvenile organisms including southern flounder, shrimp, clams and blue crabs. Recognizing the vast benefits provided by oysters, the N.C Division of Marine Fisheries has worked since the 1950s to regulate the oyster harvest and enhance reef habitat. 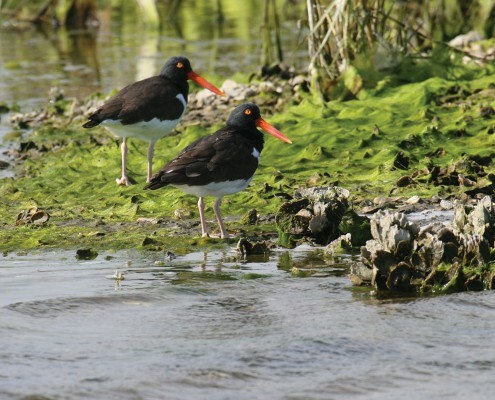 To create reefs, the division annually deposits tens of thousands of bushels of oyster shell, marine limestone, or clam shell – called “cultch”– in shellfish waters from the Shallotte River to the Pamlico Sound. The division enhances oyster habitat in harvest areas by spreading cultch, which is colonized by oyster larvae (called ‘spat’) that attach to the cultch and grow to three-inch harvest size in 18-24 months.